Summary: A muddled affair saved by a wallop of an ending that boldly asks many questions in the season going forward. Oliver is climbing to the top of a mountain. He thinks back on the last two days. After turning a perp over to Captain Lance, the Arrow is captured by the League of Assassins and brought before Nyssa. She tells him that Ra’s al Ghul has grown impatient with them not finding Sara’s killer and has enacted an old rule of the League where 50 citizens are killed each hour until the murdered of a League member is brought to justice. Oliver’s surprised to see that the assassin who will kill them is his old handler from Hong Kong, Maseo Yamashiro. Nyssa says he has 48 hours. Laurel is at the cemetery, talking to Sara’s grave, when Thea sees her. Thea asks what she’s doing and Laurel eventually reveals that Sara is dead, but that they can’t tell anyone. Ray tries talking to Felicity to explain what happened the night with their kiss, but she won’t hear it. At the Foundry, Oliver tells the team the situation and impresses upon Felicity to sort out the DNA sample from the arrows that killed Sara pronto. Diggle says they have to come up with an alternate plan and Oliver is at a loss. Felicity gets what she needs from Caitlin Snow and runs it against DNA samples on police file. She gets a hit and they are all shocked to see that it’s Oliver. He immediately believes that it’s Malcolm Merlyn trying to frame him and tasks Felicity with finding his whereabouts the night of Sara’s murder. She’s able to track a flight that left Corto Maltese and made a brief stop in Starling City the day before Sara died. Laurel is surprised by a visit from her mom. Dinah immediately recognizes that something is wrong when they talk about Sara. Ray tracks Felicity down to Verdant and explains his behavior. He tells her that he and his fiance were attacked by one of the Mirakuru soldiers the night of Slade’s attack. He tried to defend her but couldn’t and she was killed in front of him. He thought she’d be the last woman he’d ever kiss in his life until he was kissing Felicity. Laurel and Dinah have coffee, and Dinah insists that something is wrong. Laurel reveals that Sara is dead and that she was involved with some very dangerous people. The Arrow and Arsenal rough up the pilot from the flight and get him to admit that it was Malcolm on the plane. He offers them security footage. Watching the footage, they see Thea get off the plane with Malcolm. Diggle and Felicity float the idea that the DNA match could be Thea’s since she’s Oliver’s sister, but Oliver won’t hear it. He goes to talk to her and asks if she flew with Malcolm back to the city. She says that she hadn’t and had been in Corto Maltese the entire time until they came to get her. He knows she’s lying but won’t believe she committed murder. Felicity suggests the Arrow should talk to her. When he does, Oliver’s surprised to see Thea adequately fight back and demand that he leave she and Malcolm alone. Thea tells Malcolm about the Arrow’s visit and he confronts Oliver at Verdant. Oliver threatens to kill him and Malcolm reveals his plan: he drugged Thea to act as his assassin against Sara in order to draw the League’s attention. Knowing Oliver will do anything for his sister, Malcolm wants Oliver to challenge Ra’s al Ghul to a duel to square the debt, killing him to erase everyone’s problems with the League. He shows Oliver video of Thea shooting Sara with the arrows to prove it to him. Oliver sees no other choice. He sets a meeting with Ra’s and Nyssa at their Starling City location and goes to confess to Sara’s murder. He asks for the right to the challenge and Ra’s agrees. They choose a neutral location, the top of a mountain where Oliver must first survive the climb to get to, and he must be there in 12 hours. Laurel and Dinah visit Sara’s grave and Dinah recounts how they used to play grown-up when they were kids. She’s gutted, and Laurel swears to her that she will find Sara’s killer. Dinah tells her she must make them suffer. Felicity visits Ray to find out just what he planned to do in the wake of his fiance’s death and how Consolidated played a part. He shows her that he’s taken the militaristic OMAC designs from QC Applied Sciences and redesigned them into the A.T.O.M. suit that he plans to wear. Oliver tells Thea to beware of Malcolm but that he won’t force her to choose between them. He tells her he loves her. Oliver says his goodbyes to Diggle and Roy, all consciously rejecting the idea that Oliver won’t survive but aware of the possibility. Oliver finally says goodbye to Felicity, who asks him to kill Ra’s al Ghul to end this. He says he doesn’t know if he’s a killer anymore but he’ll do what’s needed to protect everyone. He leaves, telling Felicity he loves her. Oliver survives the climb, where Nyssa, Maseo, and Ra’s await him. 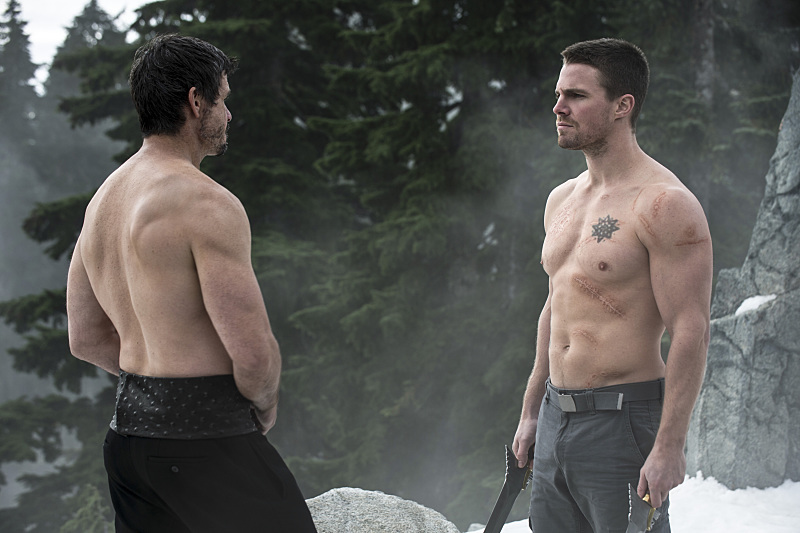 Stripped shirtless, Oliver gets to chose which swords they will use in their fight. Ra’s toys with him, allowing him to use both swords before taking one from him. They spar but Oliver is outmatched. Ra’s smashes his windpipe and stabs him in the side. With a few brief words, Ra’s them stabs Oliver clean through the chest. Offering him a prayer, Ra’s then pushes Oliver off the cliff. In the flashbacks, Oliver and Maseo learn that China White’s group is after a virus called Omega that they can weaponize into a bioagent. They infiltrate the lab and learn that one of the scientists already took the virus. They capture him and torture him into telling what he knows but he offers them nothing. Maseo realizes that he doesn’t know what he did and was likely brainwashed into doing it by a drug derived from a certain plant, the same thing Malcolm will use in the future on Thea. Learning that they’ve gotten close, China White shows up at Maseo’s home and attacks Tatsu. Oliver and Maseo arrive later to find evidence of the attack. Akio, Maseo’s son is alive and still there. He tells them that Tatsu was captured. Premieres and finales are the bread and butter of series television, always been. As TV furthers its modern claim to the mantle and cradle of premier filmed creativity, that’s become even more so. These have bloomed into full-blown events, and the last few years that’s given rise to the midseason (or “fall” or “winter”) finale before the standard long winter hiatus. These December episodes have become a particular forte of genre shows, arguably led by the adventures of a certain olive-hued archer. This year’s edition doesn’t disappoint in its shocking and confounding ending. All good finales, mid or end of season, should ask as many or more questions than they answer, and this one asks the biggest question of any series: How can you have a show without its title character? It’s a hell of a setup from which to spin the second part of the season. It’s full of tremendous possibility and ranks up there with the best cliffhangers the show’s ever done. That said, it’s hard not to feel that the hour, as a whole, was on a down curve from the previous seasons’ marquee episodes. Trying to dress it up with the briefly fun but obvious Oliver fake doesn’t diffuse the fact that the reveal of Thea as Sara’s killer was fairly pat. Sure, the fact that everyone and their mother has taken up a bow and arrows on the show left the field open. Yet, aside from the possibility of Roy, which they’d already dealt with, Thea was the remaining culprit that could provide the appropriate shock for the audience. Bringing in any number of recurring characters as suspects wasn’t going to get the job done, except for perhaps revealing that Dinah Lance had killed her own daughter. That would’ve provided an interesting but less extensive plot for the majority of our main cast, so it ends up making the most sense to take the more fascinating character development done with Thea earlier this season and run with that. It offers the biggest impact to the largest group of people storywise. That was given a demonstration in the somewhat clunky scene between Laurel and Thea in the cemetery, which seemed a bit too conveniently placed for the outcome of events in the episode. The dialogue equivalent of making sure to place the item the hero needs to defeat the villain earlier in a story so that it doesn’t come across as deus ex machina. The one downside is that Thea The Guilty was one of the prevailing fan theories, so it doesn’t offer the audience as much shock as one would think would’ve been liked. In the end, though, that becomes less the point. Although every interaction in the hour is motivated by Sara’s death and the fact that Thea killed her, it easily becomes the least interesting aspect of what unfolds. The most, of course, is the impetus behind it. 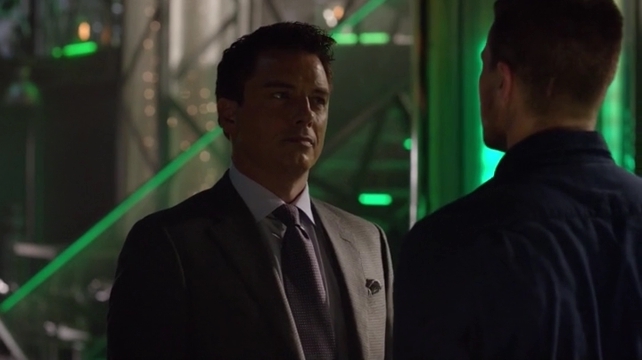 Malcolm Merlyn, three seasons on, continues to provide evidence that he might just be the most devious person in the DCwU, if not also the coldest. (This now a world with the sneaky machinations of Dr. Harrison Wells present.) There isn’t a single thing taboo to him in the pursuit of his self-interests and personal goals. He could easily have been classed as a sociopath before, but his use of his own daughter, both as assassin and as pawn to motivate Oliver, has the meter pushed all the way over to psychopathy. Yes, we were all prepared for the fact that Malcolm’s true intentions behind trying to connect with Thea, and then to train her, were going to reveal some kind of twisted plot. It was just never clear what Thea’s role was going to be. And we all thought he was cruel to Tommy. What’s oddly effective about the discovery of Malcolm’s plan is just how little John Barrowman has been used this season to this point. Even here, he pops in for a single scene to set the stakes up for Oliver. When Barrowman was graduated to series regular over the summer, there was an expectation of more of his presence. He actually might have been in less of this first run of the season than he was in the first part of Season 1. 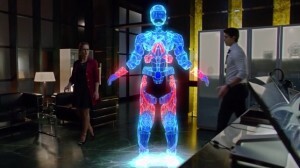 Malcolm’s presence has been felt as a quantity Team Arrow would have to deal with, to be sure, and a particular thorn between Oliver and Thea as they reconnect. Yet, not knowing his game and barely seeing Barrowman, coupled with the outright dark actions put in place to get out from under the thumb of the League of Assassins, really sells the concept of Malcolm as shadow puppet master. 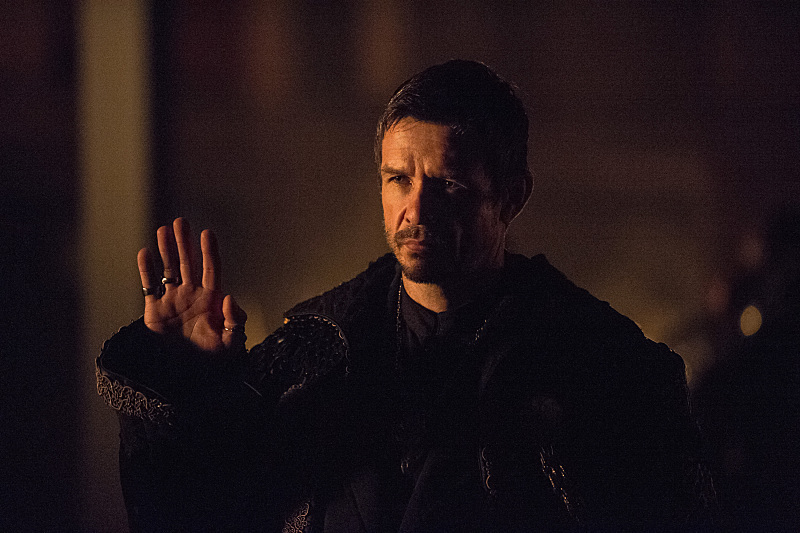 I hesitate to even bring up Ra’s al Ghul, who is painted as the big spectre of the episode given his timed ultimatum, because the set-up feeds and supports the idea that Malcolm Merlyn really is the true villain of the story and Oliver Queen’s archnemesis. Another gripping facet of the Malcolm reveal is that it helps to solidify the tenuous connections of al Ghul and the League to Sara’s death and what’s going on in Starling City. Nyssa proffers the necessary backstory to the League’s response to any member’s killing, but as Ra’s has alternately wanted Sara to return to the League and seemingly would rather have not had her around at all, it’s been a bit confusing as to why the Demon’s Head would even care. As Malcolm correctly identifies, al Ghul stands on precedent, principle, and rule, and he simply can’t have someone kill a member of the League without retribution. For me, the definitive version of Ra’s al Ghul will forever be the one voiced by David Warner, a genre stalwart famed as Jack the Ripper in the time-traveling adventure Time After Time (opposite a fictional version of author H.G. Wells), as the sorcerer Evil in Gilliam’s Time Bandits, as Gorkon the Klingon chancellor assassinated for seeking detente with the Federation in Star Trek VI: The Undiscovered Country, and as the villainous Sark and the Master Control Program in the original Tron. Just as with Hamill’s Joker, that brings up the indelible divide between animation and live-action. Warner’s voice and performance embodied everything perfect about Ra’s, from the worldliness to the arrogance to the cold madness of his determination, with Batman: The Animated Series perhaps making the character more culturally relevant than his appearances in the comics. Try as we might, though, seeing a character in live-action often tends to supplant animated work, at least in the public consciousness. We still haven’t seen much of Matt Nable’s Ra’s. What I like about his take is that it’s different from Warner’s and from Liam Neeson’s version of the character from Nolan’s Dark Knight Trilogy. The animated version didn’t shy away from the mysticism inherent in the character in the comics, while Neeson’s used mysticism more as a mirage to disguise his real-world dealings. Here, that mysticism seems alive and well, and Nable plays him like a coiled snake resting in a bath of incense smoke. They coyly play at his true age, dropping hints that he’s far older than he would appear, and give him an eerie calmness that no doubt comes from having seen much of the world and in the world over many years. Warner’s Ra’s was stern and calculating, not afraid to show passion and fight with it, but often stone-faced and methodical in how he dealt with others. Neeson’s quiet resolve and now trademarked quick bursting violent rage on-screen was used to great effect for his role. Nable, in turn, has the passion and resolve of a yogi, which seems like a slight on the surface but is hardly meant to be dismissive. This is a man so practiced and focused in channeling his mind and emotions, turning that into clinically accurate physical strike, that he effective wears the serenity often associated with practicing yoga as well as he wears his adorned ceremonial robe. They give us a taste of just how deadly this Ra’s is with his little “safety off” practice session with League flunkies, even more his swift and unswerving determination in dealing with disappointment and failure when executing the sole survivor of his fury. It gives weight to the final duel between Ra’s and Oliver. He’s not going to pull punches nor waste time on sentimentality that could somehow convince him his rules are not unbreakable, almost natural, law. This makes the hour seem more exciting than it actual is, and when we get to that final three-minute sword fight atop a snowy mountain, it definitely reaches for that import. Before we get to that point, though, the episode is kind of muddled. Once again, Oliver is blind to the possibility that anyone in his family could do wrong. With Thea, there’s a part of him that’s right. She was, in fact, brainwashed by a drug into killing Sara. Yet, his stubbornness, even when confronted with it by his closest allies who have more than their fair share of knowledge, lead us through an unexceptional trudge through Oliver finding his way to the truth. He doesn’t find it, though, instead having it dropped into his lap by Merlyn. In a sense, one could view this as Oliver ripped bare and left useless and ineffective by the League’s deadline. Narratively, that plays. Yet, it seems to be more a symptom and example of the writing and plotting of the season so far. Aspects are starting to come together, and the best outcome of this episode is that it seems to galvanize the disparate plot threads into a cohesive story worth investing in as the story moves forward from here, finally giving it some thrust. The majority of these nine chapters on the season have felt loosely connected, at best, and while there have been highlights, this feeling of searching around for a story has made the season feel less engaging on the whole. That’s reflected in the run-up to the final duel, in scenes like the aforementioned cemetery confessional between Laurel and Thea and the unintentionally but slightly comical interrogation scene between Thea and the Arrow where Oliver learns that his sister knows kung fu. Still, despite being forced into the situation by Malcolm, it’s very noble and very much in character for Oliver to offer himself up to Ra’s in place of his sister. This trades on our familiarity with the show to be as affected by that choice as we are. I enjoyed the fact that Maseo, Oliver’s Hong Kong handler, pointed out the flimsiness of Oliver’s acceptance of guilt. It’s likely that Ra’s saw right through the deception, as well, and it remains to be seen what kind of impact that will have on the rest of the season. Impact is an understatement when it comes to that ending. 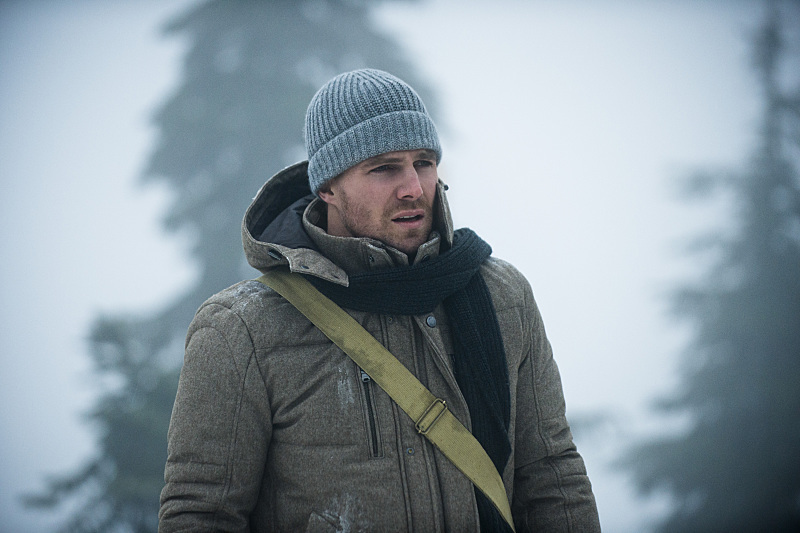 The way the episode was structured, with Oliver climbing the mountain and looking back on the events of the episode as he struggled up the rocks, it wasn’t hard to imagine that they were marching Oliver to his death. After all, who is this Oliver Queen to Ra’s al Ghul but someone who needs to be punished; he won’t show mercy. The outcome wasn’t so much the surprising part as was that they stuck to their convictions to go through with it. 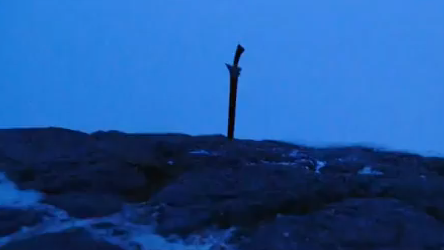 Even more so the use of an actual cliff in a cliffhanger, pushing Oliver’s impaled and dying body off. They wanted to make a point. Nothing is sacred on this show and anything can happen. It was definitely made. This brings us to the interesting conundrum of just what happens from here. We have no shortage of heroes. Roy, Diggle, and Felicity still exist to carry on Team Arrow’s mission. For all intents and purposes, Thea is now in the wings, with an arc of her discovery of the truth her father’s plot and how best to employ her new skills waiting for her. And then there are our two fledgling heroes, working to make their debuts on the world stage but perhaps now to be thrust in the spotlight faster than originally thought. It’s not for nothing that they’ve heavily paralleled Ray Palmer’s journey toward becoming the Atom with Oliver’s. From assuming control of Queen Consolidated, to using the salmon ladder, to enchanting the affections of one miss Felicity Smoak, he’s fulfilling the archetype the show has established for its heroes. (Even Barry Allen hit some of these some points.) Just add in one devastating backstory and you can fire up the exosuit. That they do with an affecting story of Ray losing his fiance during Slade Wilson’s attack on the city. It’s even a valid reason for him pulling away from Felicity as he did, and one that continues to endear him to the audience. This seems to be becoming a recurring theme ’round these parts but Brandon Routh and Emily Bett Rickards deserve strong notes for their work here. In fact, one of the saving graces of the episode is that all actors are doing strong work throughout the hour, even with both cemetery scenes (Laurel & Thea, Laurel & Dinah) and the Thea-Arrow confrontation being shaky. It goes a long way towards smoothing over the roughness of the episode while teeing up the emotional stakes for Oliver’s (alleged?) demise. As for the other heroic neophyte, I’ve talked at length about the push for Laurel towards becoming Black Canary. Certainly, a dead (or believed dead) Oliver Queen, and an Arrow-sized hole, will have her feeling like she needs to be out on the streets before she’s truly ready to be. Theories abound, and there are certain elements provided by the players and events in this story that might offer clues, or maybe misdirections, about where things can go. Those won’t be discussed here for fear that some might not want to be spoiled. You can expect that we’ll be doing a roundtable session or series during the hiatus where we’ll be more than happy to float a few of our own. The exciting part is that we’re all swimming in possibilities. With such a strong ending that begs us to ponder those possibilities eclipsing the entire hour, it would be easy to think of “The Climb” as a strong finale. Instead, it represents more the tepid and muddled approach to story that the season has had to date. 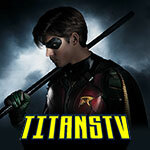 Perhaps, at season’s end, when everything shakes out and we’re provided with all context, the hodgepodge quality of this nine-episode fall run will feel clearer and more connected. “The Climb” does manage to tie much together, which is an exciting development for the season when it comes out of the long hiatus. As for its relation to everything before the hiatus, let’s just hope it represents a capper to the ho-hum. This was one of those episodes where the flashbacks explicitly relate to the present, with Maseo introducing Oliver to the use and effects of the plant vutura to brainwash someone into doing something they’ll never remember. The dialogue between Oliver & Maseo meeting again in the present suggests that they aren’t likely to see Tatsu again in the flashbacks. Her capture by China White seems to lead both to think that she’s dead. She might be, but I wouldn’t be surprised if we see full-on Katana in the present in the second half of the season. Maseo’s adopted name sounds close to the Arabic word Sarab. He identifies as Arabic for “phantom.” The English translation of Sarab is actually “mirage.” Not sure if this is a misdefinition on the writers’ parts or an intentional clue. Yeah, I get the earlier “creepy” complaints about Ray’s behavior now with the whole phone pinging thing to track Felicity down. A.T.O.M. stands for Advanced Technology Operating Mechanism. His concepts fall in line with his “wearable” philosophy, making things small and useful and easily available by wearing them. Ra’s calling Oliver “boy,” while relatively true, was both condescending and judgmental. At the same time, it felt commanding and empowering for the character. Ra’s states the vision and purpose behind the League: They are to replace evil with death. It’s an intriguing viewpoint behind what they do, though depending on one’s moral compass, they could just as easily be seen as evil, as well. In talking about his “first” kill at age 11, and then casually mentioning that “it’s been 67 years years since someone challenged [him],” they have fun playing with Ra’s age. Whereas the Neeson version of the character was all about deception, mimicking the impression of long life and supernatural survival through a shell game with willing disciples, this guy seems to legitimately be living prolonged life. With metahumans existing within the DCwU, could some other metaphysical aspects exist, as well? The intention was clear, but Thea going over the railing to escape the Arrow during their confrontation added a level of camp that the scene didn’t need. The use of the term “Omega” for the bioagent that China White stole in the past is fascinating. The term, the last letter in the Greek alphabet and often used to refer to the end particularly in religious contexts, is often most associated with the New Gods villain Darkseid in the comics DCU. The term is also associated with the novel I Am Legend, which has been adapted as four different films, The Last Man on Earth, The Omega Man, I Am Legend, and I Am Omega. The novel is social commentary using a disease that causes vampirism sweeping over the world. The adaptations deal, in various ways, with the same premise, though the last two explicitly treat the plague as a man-made virus. It’s hard to say if these ideas were taken into account, and it could just be coincidental. Perhaps the best way to put season three of Arrow thus far is that it’s been something of an experiment. A tricky experiment, at that; it’s abandoned the densely-plotted breakneck narrative that made it a success for something much more ponderous and introspective. It’s felt like laziness at times, as this season has been mostly meandering and aimless. But it’s also so starkly different from the previous season that these must be conscious choices, for better or worse. “The Climb” is thus more or less effective depending on how you’d like to view this season, then. It’s a tragic catharsis, and answer to all our questions that we didn’t want to hear. Or it’s a confirmation that we could have done without half the episodes and still reached the same conclusion. 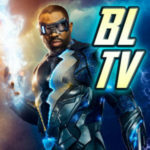 It was either worth the wait or it wasn’t, and many comments that The Flash’s more traditionally plotted arc led to a better midseason finale supports this. Where it counts here, though, is that it functions as a very good singular episode. It’s moody and slow at points, but the cuts to Oliver’s climb and the constant ticking clock of dread keep the wheels turning. There are numerous revelations, some we already knew and many we didn’t. But the cleverness of “The Climb” lies in how each mysteries unfold, and which parts are focused on. There are a couple of small reveals here that function as major turning points for the show. One is Maseo’s presence in the present day League, finally tacking an endpoint for the Hong Kong flashbacks in the same way that Slade’s arrival in “Three Ghosts” did for the island. Unlike that Slade reveal, though, Maseo’s appearance is rather subdued, mostly used to throw in another ripple rather than cause genuine shock. There are more important things happening in the episode, and the focus is smartly on the right thing. “The Climb” features other smaller bits that set-up the back half of the show; Laurel’s mother learns the truth about Sara, and pretty much condones Laurel using violence against her killer, surprisingly. And Ray Palmer is exactly the superhero we expected him to be, or will be, and may become an odd type of competition for the superhero world as much as he is in the romantic one. But, again, these are obligatory story thread movements for “The Climb” as a midseason finale. The reveal of Thea as Sara’s killer is really at the crux of this all, and a prime example for how well the episode juggles its mysteries. This is either a huge shocker or totally predicted, depending on who you ask (I posited the Thea theory in a couple of reviews, as did many others on the internet.) But with most of the candidates crossed out over the course of the season, and even more clues teased right at the top of the episode, “The Climb” doesn’t focus on the shock factor. In fact, the reveal is rather underplayed; I mean, Oliver Queen’s kid sister killed the first Black Canary. That’s utterly ridiculous, but it’s been carefully set-up as the backdrop of the season, and that it’s part of a long game from Malcolm with the help of hypnosis does it without undermining any characterization. What we focus on, rather than the identity reveal, is the impact that reveal has on the rest of the characters. The full threat of the League is felt here, in that Oliver is completely incapable of taking any third option. There are no clever plans to get out of this, all Oliver can do is exactly what Malcolm told him and follow the rules of the League. It’s uncertain who the true Big Bad of the season will be coming out of this, between Ra’s and Malcolm, but they both managed to create scenarios that prove themselves all too capable of winning. This hour is also about clarifying what’s truly important to Oliver, after a half-season of grappling with his own humanity. It’s simple, tying back to Oliver’s revelations at the end of season one: he fights for people he loves, and that’s what matters. In spite of all the complexities surrounding this situation – he also finds out Thea has a dark lying/fighting side – and in spite of how impossible it may be fighting the League, it’s that simple truth that makes him Oliver Queen as much as The Arrow. He needs to protect Thea, and facing Ra’s is the only way to do it. Facing that impending death is an important moment of clarity for him, evident in that he tells Felicity he loves her without any of the cloudy non-answers and ambiguity of other occasions. And it’s evident when he does actually face his death, as the faces of his most beloved family and friends literally flash before his eyes. Oliver has doubt how he can be Oliver Queen all season, and “The Climb” posits that they key really was love all along, cheesy at it may be. But the context is why it doesn’t play as something hammy, because he doesn’t realize this until his life is literally ending. Because, of course, this is a tragedy first and foremost. Oliver’s fight with Ra’s is absolutely breathtaking – not because it’s any better choreographed than Arrow’s fight sequences, but because it’s so remarkably swift and brutal. The silence and washed out lack of color is a stark contrast to the show’s usual bombastic fight sequences, which immediately adds more weight and dread. There are moments when it seems as though Oliver could have the upper hand, with the musical motif triumphantly returning, only for Oliver to be stricken down more brutally or easily than any fight on this show. It’s a traumatizing moment for the show, quite frankly. Yeah, sure, our title character is coming back eventually. But the sense of dread is built up so steadily throughout Oliver’s climb and through his fight that we’re anxiously waiting for this all to end, simply to relieve the tension. That makes it all the more devastating when that tension, and the problems of this uneven half-season in general, is finally relieved…with a swift sword through our hero’s chest.